I found an possible bug in Isadora (last stable release, Windows 10, USB version), what happens is that the max and min values of an user input can not be changed after the min and max has been set before. Well actually you set the min max values outside of the user actor. Instead of changing the min max in "user input" actor leave it at min max. Now close the user actor and set the min max values as you wish. I don't think this is a bug you just have two places to set the min max value that have to be updated individually. It does work fine for me. Leave the "user input" actor at min and max and I can update the min max values outside of the user actor anytime without a problem. This is not a bug, though it is perhaps a bit confusing. The team and made the decision some time ago to adopt the current behavior. When you update the range of a User Input, it does not automatically update the Scale Min/Scale Max values for the external input on the outside of the User Actor. There is a good reason for this: it is very possible that you have set specific ranges for the external input, and you don't want Isadora updating these without your consent. For example, make a new User Actor, add a floating point User Input with a range of -50 to +50 as shown below. Now close the User Actor and click on the title of the input to show the Inspector box. You'll see the range you expect here, -50 and +50. Now change the range from -50 and +50 to +25 and -25, which both limits the values and inverts them. Now double click the User Actor, and change the range of the input to -100 and +100. Close and save the User Actor. When you click on Input 1 again, you'll see that the values are still set to -25 and +25. Now, double-click the User Actor again, edit the User Input on further time so that the limits are -10 and +10, and save the User Actor. If you look at the inspector box again, you'll see that the values were changed. This is because you can't have a Scale Min/Max setting of -25/+25 when the actual maximums are -10/+10. So in this case, it does change the Scale Min and Scale Max. In previous versions of Isadora, saving the User Actor did update the external input limits, and this totally messed up people's patches. I can understand why you saw this as a bug, but it is the only way we could come up with to manage this situation. I'm still experiencing a bit of confusion at the moment. The output of our Actor doesn't show 12..
Why ? Both the input (external) as input (internal) are set to exactly the same. And why does Isadora shows -10 and 10 as LIMIT labels.. Shouldn't that be linked to the internal input / external input scale values so that we don't have 3 different parameters to update. It causes quite some confusion by the user.. 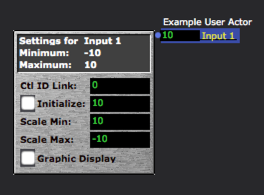 The Limit Min/Max of the User Input is set to -10/+10. So no value beyond that can pass through. Alright.. I also got that. But why does it work that way ? If I set the MAX / MIN in the double click dialog shouldn't it be the same as the LIMIT MIN/MAX ? Why are there 3 different limiters (MAX / MIN Dialog, The LIMIT dialog, and the external input Scale MIN / MAX) inside a single Input value. In my opinion linking the LIMIT dialog to the MAX / MIN Dialog makes perfect sense. Well, as with many things in Isadora, I can only say that it seemed like a good idea in 2004. I don't mean that as a cop out, but my actual thinking at the time was that it was good to have everything behave the same way... I mean, the User Input is an actor with a numeric output, so it should have it's own Limit Min/Max. Certainly this is a topic worth revisiting for the next release. (@Michel @Skulpture @DusX @mc_monte @crystalhorizon take note... let's not forget this issue.) But I'm sorry to say isn't something we're going to change for v2.6. That is fine. Just curious about the design choice and understanding the software :) Thanks for the replies and the great explanation . I don't see this as a bug. However I can understand the bigger picture and can see your POV. Just an idea; but what if the external input scale(s) [MIN/MAX] was greyed out; so when you changed the inside scales [MIN/MAX] were grey so it was a visual indicator that it can't be changed.